A new crop of development is about to sprout up on the western edge of downtown, bringing with it a proposed 493,000 square feet of office space, 70,000 square feet of retail and 370 apartments. Schlosser Development Corp., the dominant player in the area, is behind much of the new plans in the Market District, as the area around Sixth Street and North Lamar Boulevard has come to be called. Whole Foods Market Inc.’s (Nasdaq: WFM) headquarters and flagship store on the northeast corner. The office and retail complex that is home to HomeAway Inc.’s (Nasdaq: AWAY) headquarters and West Elm on the southwest corner. The retail center with Office Max, Starbucks and Pure Austin Gym on the southeast corner. “The Market District is an active and vibrant retail setting that continues to build and succeed,” said Rick Duggan, director of design and construction at Schlosser Development. Office space is in high demand also, brokers said. The last significant office building built was the Frost Bank Tower in 2003. Since then, the occupancy rate downtown has reached about 86 percent, and there aren’t many large spaces available. Consequently, the average rental rates downtown are at least $6 higher per square foot than the rest of Austin, Cushman & Wakefield reports, and landlords are almost doubling rent during renewals. 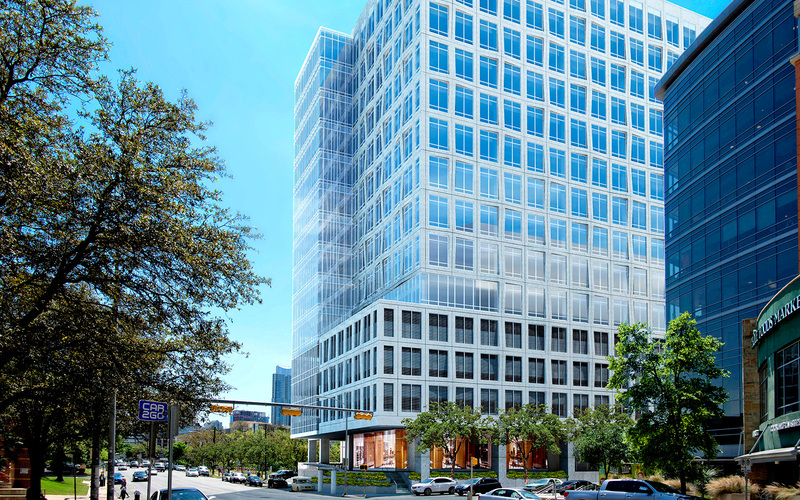 The tallest project planned for the area will be south of the new Whole Foods offices, on about one acre, between the Tiniest Bar in Texas and Gables West Avenue. Endeavor Real Estate Group and Lynd Co. are planning a 35-story building with 42,586 square feet of office space, 3,385 square feet of retail and 359 apartments. Developers had faced some challenges in 2011 because of the Heritage Tree Ordinance, but the site plan recently filed with the city states that they had received a variance to remove one tree that is dying and a permit to move another elsewhere on the property. The project is still undergoing the city’s site plan review process. The biggest project planned in the area will sit on the parking lot east of Whole Foods Market headquarters and will provide additional office space for the Austin-based grocer, Duggan said. Whole Foods representatives couldn’t be reached for comment, but they’ve discussed plans in the past to double their corporate staff in the coming years to about 1,300. Duggan said the Whole Foods-anchored project is still in conceptual design, but tentative plans call for two buildings on the 2.7-acre lot with a total of 52,000 square feet of retail, 346,000 square feet of office space and 1,218 parking spaces. One building may be up to 20 stories tall, while the second would be about five stories tall because it is in the Capitol View Corridor, so the height is limited to 75 feet. On Third Street and Lamar Boulevard, Schlosser Development plans to break ground on a 25,000-square-foot, three-story retail and office project in mid-April that’ll be called Fourth & Lamar — even though it’s technically on Third Street. The site is currently a parking lot to the south of the Office Max retail complex and west of the Spring Condominiums. The three-story building will consist of 16,000 square feet of retail space on the ground floor and 8,500 square feet of office space. Farther north on Lamar Boulevard, Schlosser Development is still in the permitting stages of a 15,000-square-foot retail and parking garage project. The old KASE-KVET office building at the northern end of the parking lot for Book People and Anthropologie will be redeveloped with retail fronting Lamar Boulevard and parking. The parking garage will be managed by SDC Property Management.